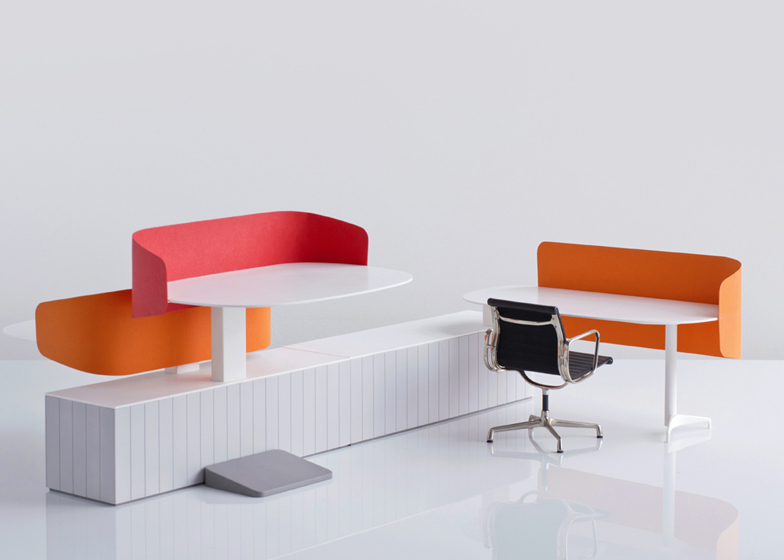 Product news: London studio Industrial Facility has designed an office furniture system for American manufacturer Herman Miller that promotes interaction in the workplace (+ slideshow). Industrial Facility created cantilevered tables with rounded edges to encourage movement and provide space for users to gather round work stations as they would around a meeting table. Low, linear units covered in vertical planking combine to create a unifying spine along which modules acting as desks, social areas, meeting tables and a library can be arranged. Screens wrap around the desks to provide privacy, while the height of tables, screens, easels and storage can be adjusted to create a more personal and less rigid arrangement. "One could argue that collaboration is a buzzword right now, that somehow it might go away, but we think this is unimaginable," says Sam Hecht of Industrial Facility. "People are collaborating globally, empowered by digital networks, but the most ambitious businesses still need productive, collaborative physical environments." 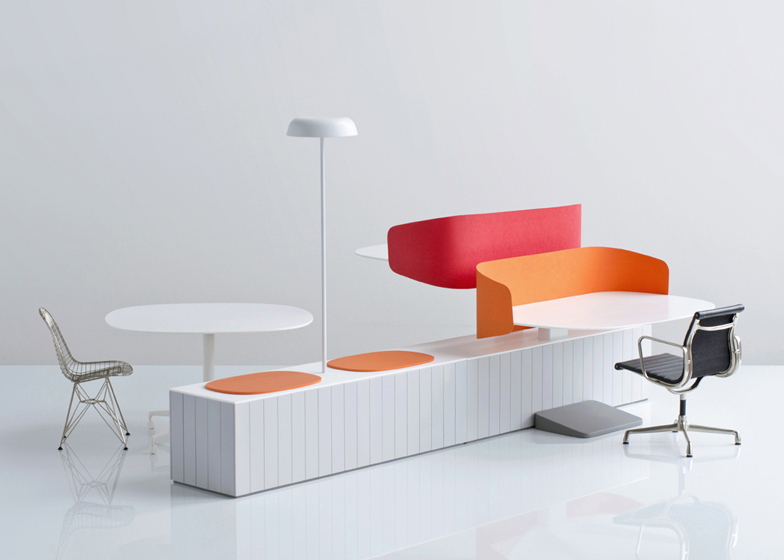 The system was presented as part of Herman Miller's Living Office project at the Neocon trade fair in Chicago last week, alongside modular office furniture by Yves Behar's San Francisco studio Fuseproject. Sam Hecht and Kim Colin of Industrial Facility previously collaborated with Herman Miller on a two-tier work table with a sliding surface, and launched new products in Milan this year including a lamp that projects light onto the tabletop and a three-legged wooden stool. What is work today? It is as much about the individual as it is about the company. It is the individual who brings an organization to life. An organisation benefits from creating an office environment that connects people in a more natural way. The reason to come to work is to work together, to collaborate. 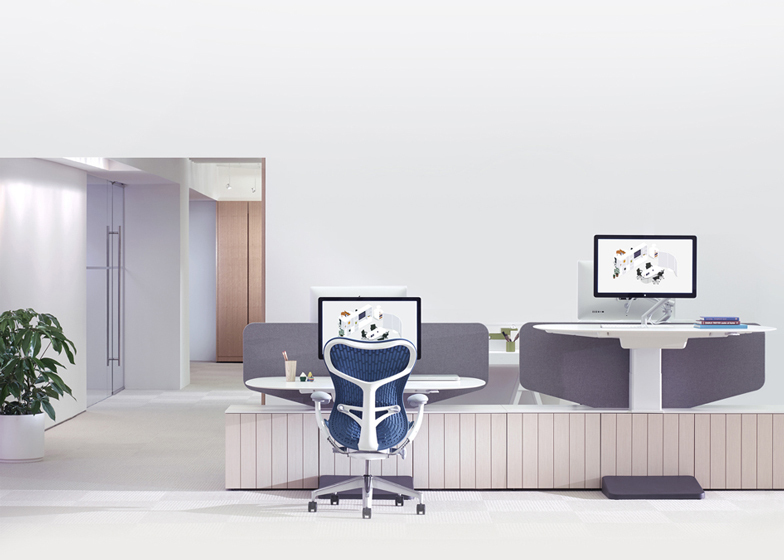 Herman Miller, Living Office. 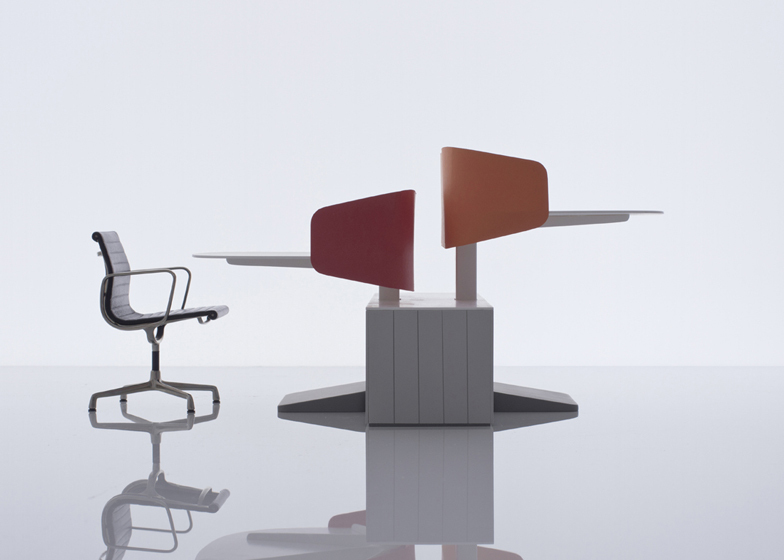 Locale is an intelligent office furniture system that previewed at NeoCon 2013 as part of Herman Miller’s Living Office. Locale promotes collaboration at work by creating dynamic, high-performance neighborhoods that allow for free movement, variety and adjustability. Locale makes working together simpler and more pleasurable by promoting interaction around large, adjustable tables, and by fostering easy transition between focussed work and collaboration. 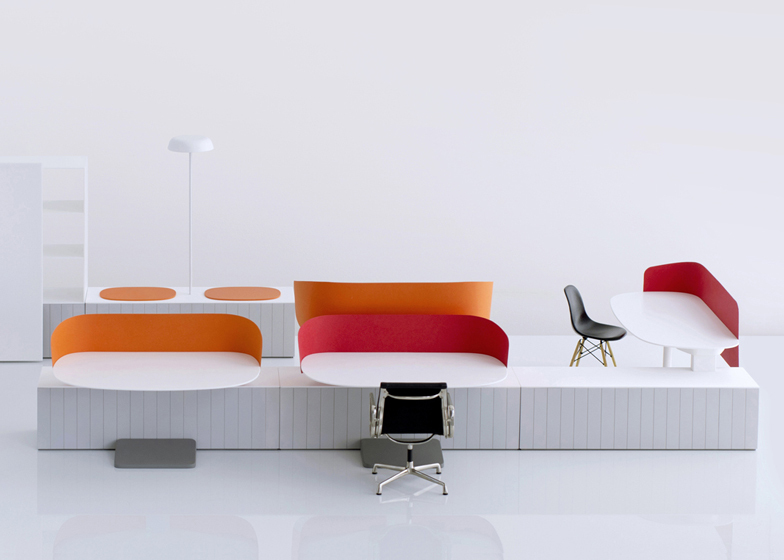 Cantilevered, rounded work surfaces give individuals more space to change position throughout the day and can easily accommodate multiple colleagues to sit or stand together without the clutter of legs at floor level. Locale simplifies the usual chaos of collaborative work and cleverly balances individual and group needs within an open plan office. Locale has been in development for more than two years. During this time, the conditions of work in terms of atmosphere and attitude have shifted, so it was important that Industrial Facility leapfrog any old preconceptions of the modern office and propose a new place based on deeper social and cultural changes. 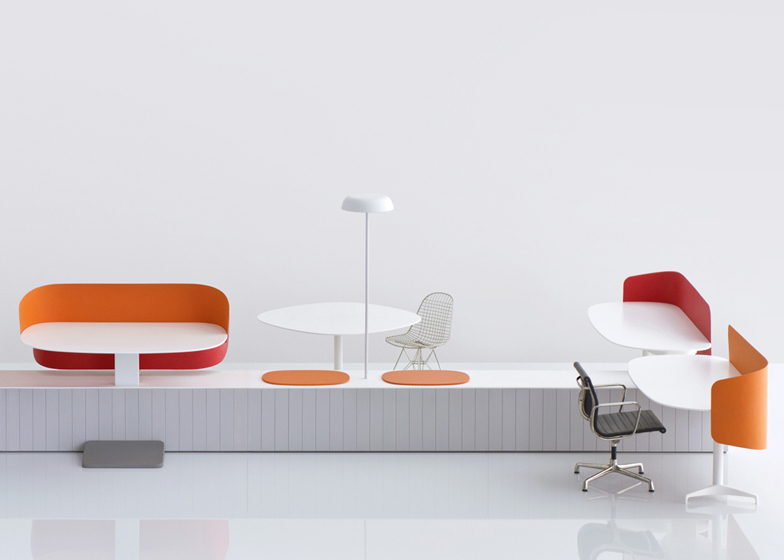 Herman Miller research noted early in the project that the office now should become 'a place you want to be' rather than 'a place you need to be'. However, Hecht and Colin remained suspicious of recent efforts to evoke a kind of forced playfulness in the office to achieve this. Locale addresses a significant paradigm shift that sees in-person communication as increasingly relevant to productivity, effectiveness and enjoyment at work. 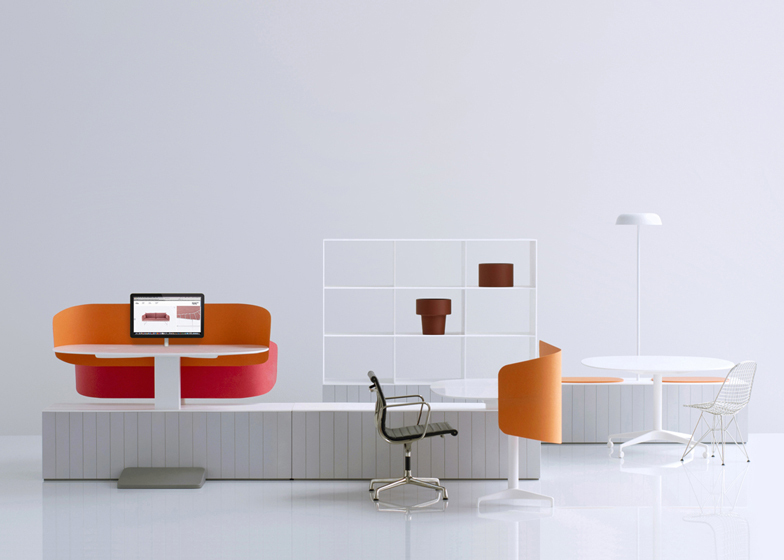 Locale organizes the office into clusters of activity along a Workbase, a linear, low, architectonic element that helps give definition and organisation to the open-plan office. Distinct clusters are composed out of different functional modules; the result is that seemingly disparate functions of the office reside comfortably together along one line of the Workbase, which organizes the plan orthogonally. The library, the social setting, the working desk, and the meeting table are all close by and visually coherent along the Workbase. Useful mobile pieces (height-adjustable tables, screens, easels, storage, a refreshment unit) can be 'pulled up' to customize the group and individual settings off the Workbase, making an even richer neighborhood. Clusters can be wider or narrower, with adjacencies nearer or further, depending on need. Spontaneous interaction or unplanned communication increases productivity at work and Locale encourages this in the open plan office without relying on broader architectural-scale social devices like open stairs and community eating areas. Screens attached to the Workbase or parallel and perpendicular desks allow a balance of visual separation and porisity in the cluster. A lot of engineering effort was spent getting rid of legs on the desks and in creating a mobile table and accessories program so that work can occur easily, sitting or standing in a variety of settings. Locale brings different parts of the office together in proximity so you shouldn't have to go away to talk to a colleague in a more conducive manner. Instead, you can raise a table, stand, and discuss. You don’t have to move to completely separate spaces to accommodate varied work styles. Locale is planned for availability in the Winter of 2013. A third of working people are now mobile, up from a quarter since 2006. The world's top companies spend 40% of their time collaborating, compared with 21% on focussed work. A healthy work life is one that lets you adjust. To sit, to stand and to walk will let you work better and live longer. Kim Colin – "We find a lot of value in our own office, which is small, highly productive and considerate. We are all from different parts of the world, which says a lot about how the free movement of people has created a multi-dimensional condition. We collaborate constantly about ideas, methods and opinions. We travel a lot. Our work is never created in cultural isolation, and therefore our office itself behaves like a good, condensed international neighborhood, which is efficient, energetic and pleasurable." Sam Hecht – "One could argue that collaboration is a buzzword right now, that somehow it might go away, but we think this is unimaginable. People are collaborating globally, empowered by digital networks, but the most ambitious businesses still need productive, collaborative physical environments. The offices we visited during our research—places where people want to work—are open-plan, transparent, and energetic."